The Arc of Somerset County has been awarded a $15,000 grant from the Toys“R”Us Children’s Fund through its 2011 New Jersey grant initiative. The one-time grants were given by the Fund to alleviate economic challenges and sustain organizations that favorably impact children across New Jersey. The Arc of Somerset County was one of 54 organizations selected from a pool of more than 500 proposals from charities requesting funding from across the state. 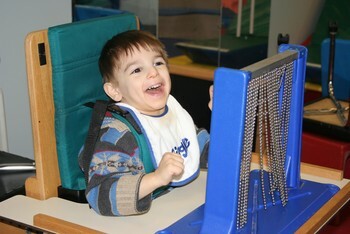 “A subsidized tuition program for therapeutic groups and childcare allows families that do not have the financial resources to pay for these services and ensures that their children with developmental disabilities/delays are receiving the necessary support and services to encourage optimal growth and development,” said Executive Director Lauren Panarella. The Arc of Somerset County has been providing programs and services for children with intellectual and developmental disabilities for nearly forty years. The agency now serves more than 250 children and their families through early intervention, developmental daycare, family support programs, and various therapeutic and respite groups at the Jerry Davis Center for Children and Families in Manville, New Jersey. Toys“R”Us, Inc. has a long history of giving back to the communities it serves by keeping kids safe and helping them in times of need. The company and the Toys“R”Us Children’s Fund together have given hundreds of thousands of dollars in product donations and monetary grants annually to a wide range of nonprofit organizations in New Jersey. For 38 years, Toys“R”Us, Inc. has been based in New Jersey with more than 4,500 employees across more than 45 stores, regional offices, the corporate headquarters and the company’s largest retail distribution center in the country. For more information about Toys“R”Us, Inc. charitable giving and the Toys“R”Us Children’s Fund, please visit Toysrusinc.com/charitable-giving.